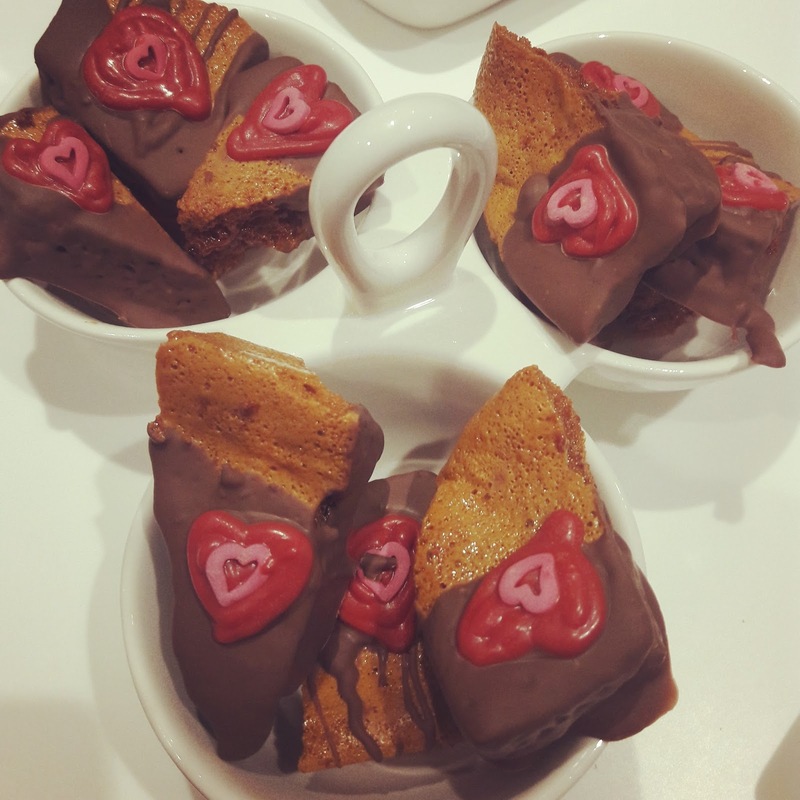 These are really easy to make, and taste almost like Crunchie bars. My first attempt was not so good - they tasted somewhat burnt, but the second time they worked beautifully. Make sure you have everything to hand before you start, as once the mixture hits the right temperature, you need to move fast! 2 level teaspoons bicarbonate of soda. To prepare, line a baking tin loosely with greaseproof paper. I used a 20 cm square one, but you can use a bigger one and get thinner shards. Sieve the bicarbonate of soda into a small bowl so it's ready to chuck in when needed. In a large saucepan (it needs to be large as the mixture will triple in size at least), slowly melt the sugar and golden syrup until the sugar has dissolved. You can stir it to prevent any crystallization. Bring it up to a boil and let it boil for about 2 minutes (no longer!) until it turns an amber colour, then take it off the heat.. If you have a sugar thermometer let it come up to 150 C then take it off the heat. Off the heat, quickly add the sieved bicarbonate of soda and whisk it really fast. The mixture will rise up and create lots of air bubbles - whisk it well to absorb all the bicarb - you don't want it to taste soapy! Immediately pour this mixture into your prepared tin and allow it to cool completely. 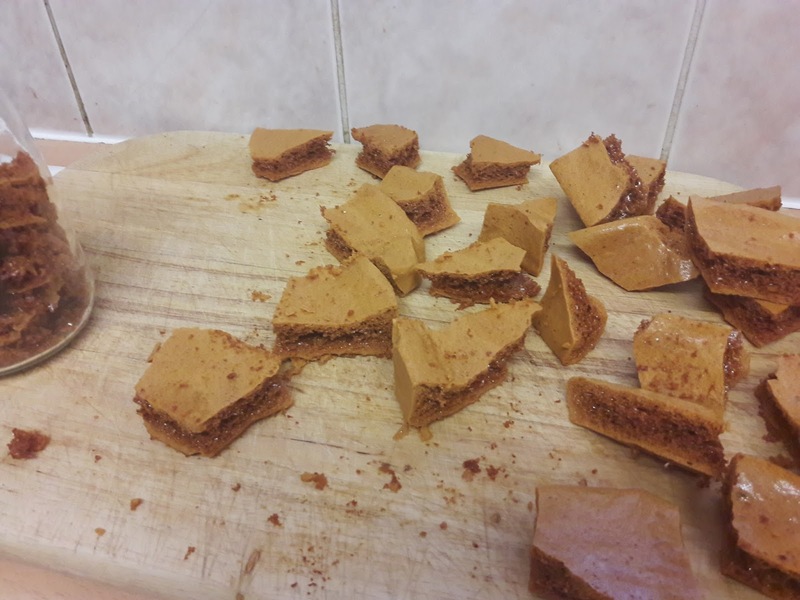 Once it's cooled, break it into pieces - you can try cutting it neatly but it's unlikely to work, it will just shatter into shards! To decorate, melt the chocolate in a Bain-Marie, and dip each shard into the melted chocolate. Set aside on clean greaseproof paper to set. Melt the candy melts, and add a little olive oil to make a smooth piping consistency. Make sure it's not too hot when you pipe, as it will melt the chocolate! Using a thin nozzle (or just the end of the piping bag snipped off) pipe heart shapes, fill them in, and allow to set. 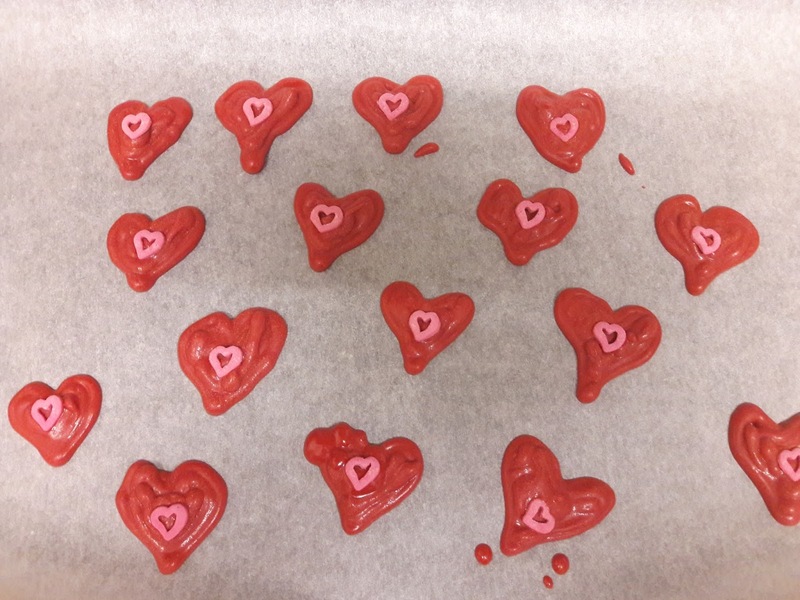 If you wish to stick on extra heart-shaped sprinkles at this point, or any other lovey-dovey stuff, go for it! With any leftover candy melts, you can make little heart sweeties. Aw!! !